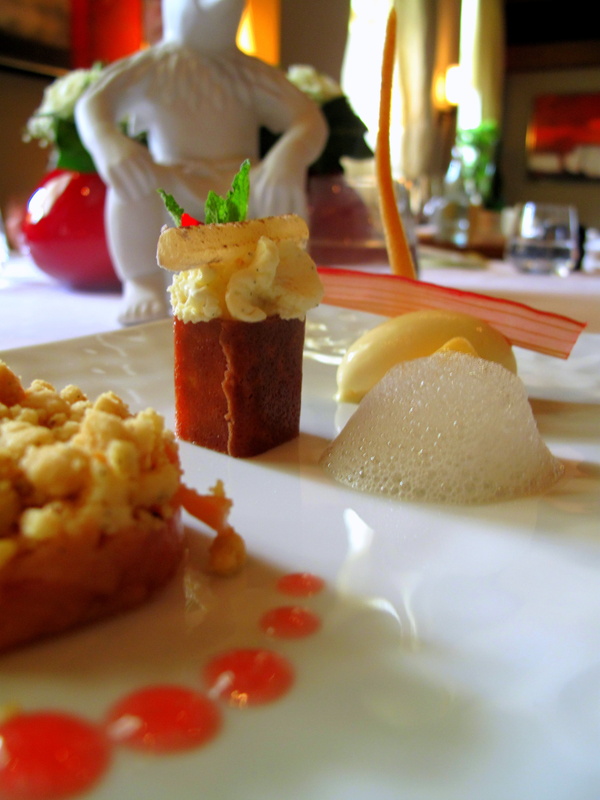 "Bau prepares a dish at Victor's Gourmet-Restaurant Schloss Berg "
"Interview mit Christian Bau "
"Busy at 3 Michelin Victor's Gourmet-Restaurant "
A lot of dishes are inspired by japanese cuisine. Still there are quite classical french and mediterranean dishes throughout the menu, which to my taste didn't fit in too well in the dramaturgy. Maybe that's just a matter of personal preference. They were good dishes nevertheless. Nice selection of Riesling on the wine list. 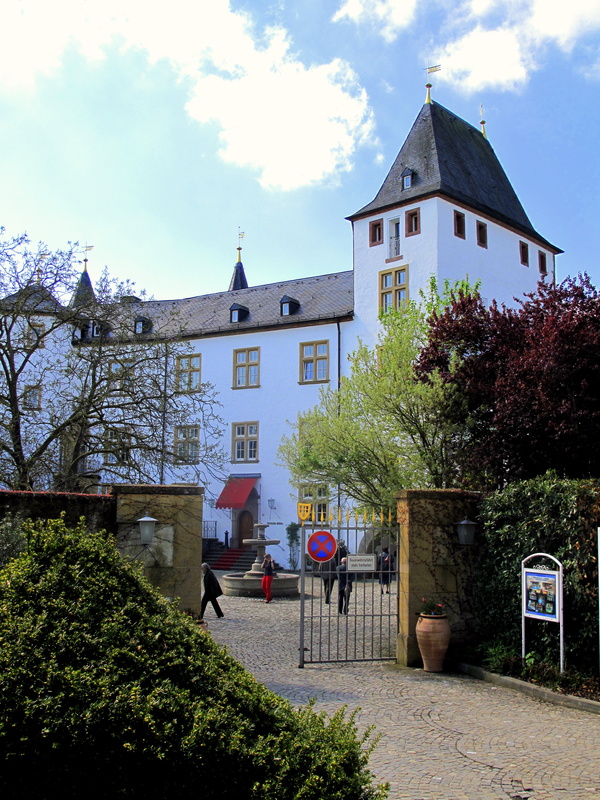 Today, this building, completely restored after the second world war, is no longer some prince’s pleasure palace, but instead part of Victor’s Residenz-Hotel Schloss Berg. 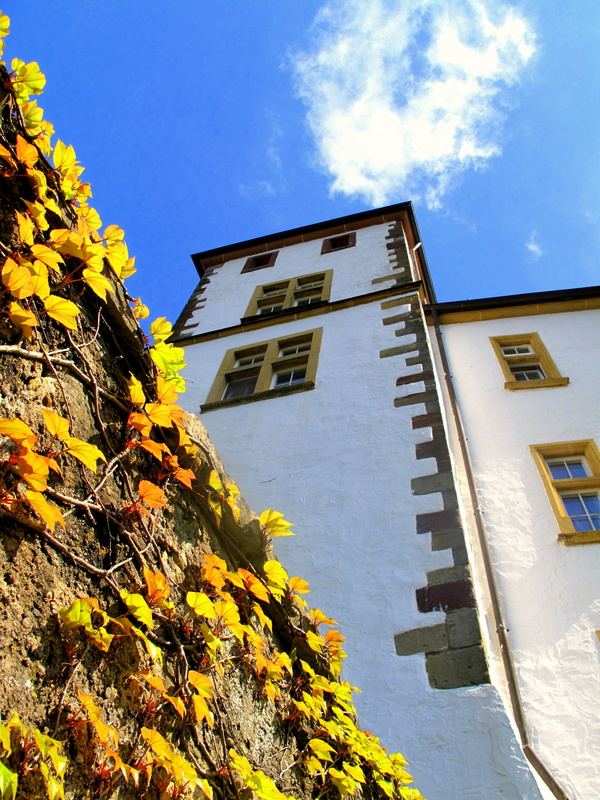 The lodgings themselves are housed in a Mediterranean-style villa close by, but within the castle itself, Germany’s youngest-ever three-star chef has sovereign rule. Here, Christian Bau reigns in the kitchen whilst his wife, Yıldız, runs the dining room. The pair first met whilst Bau was only just an apprentice at Hotel Götz Sonne-Eintracht in Achern. Born in the Black Forest, this position was the Offenburger’s first although it was actually his second stint at this restaurant: at fourteen he had completed a six-week internship here. Finding cooking a release, he returned two years later to begin his training proper. 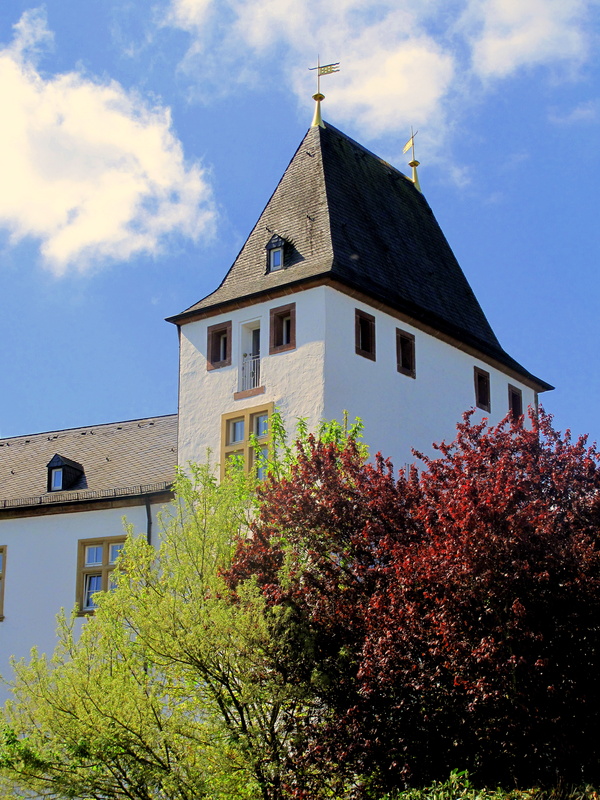 Three years on, having gained a classical groundwork, he left for the hotel-restaurant Talmühle in Sasbachwalden. For a year, he worked under Gutbert Fallert and learned the essentials of haute cuisine prior to twelve months completing his compulsory military service – in the officers’ mess of course. 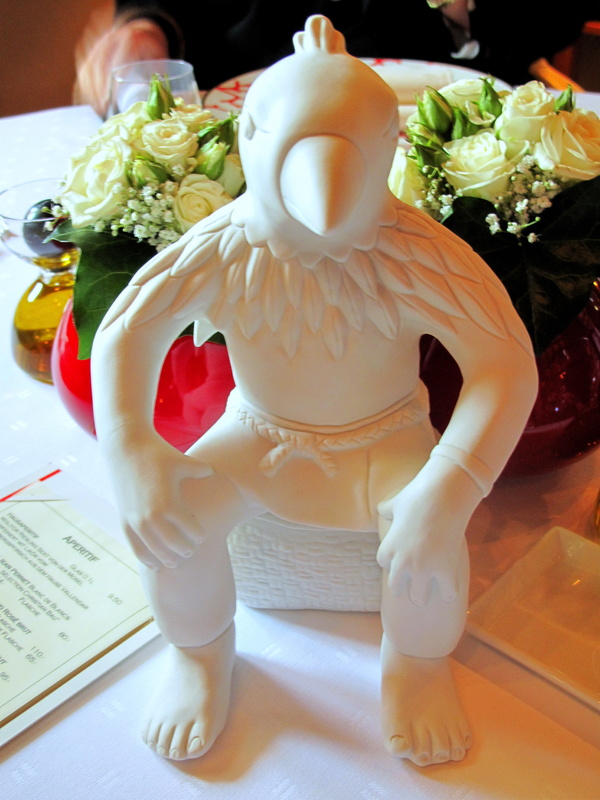 Subsquently, he passed 1992 at Le Canard in his hometown before moving onto the kitchen that would influence him most – Schwarzwaldstube at hotel Traube Tonbach in Baiersbronn. Bau, quickly becoming sous chef there, spent five years with iconic German chef Harald Wohlfahrt, considered by many as the country’s finest. 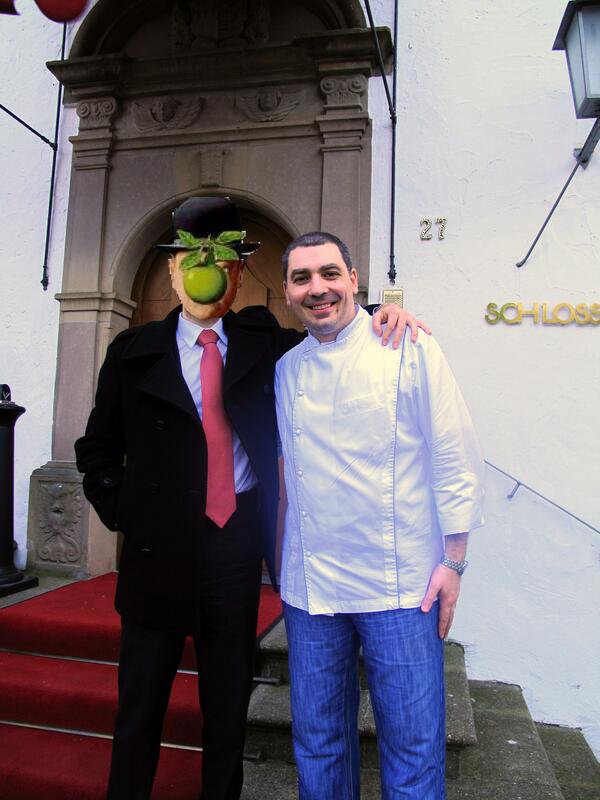 During this period, Christian and Yıldız – nine years after following each other from restaurant to restaurant (except for the latter’s brief return to Hotel Götz Sonne-Eintracht and spell at Alde Gott whilst the former was in the army) – married in 1996. The very next year, the couple had their big break: visiting a close friend near Nennig whilst on holiday, they met the owners of Victor’s who coincidentally happened to be eager to add a gourmet restaurant to their existing hotel and casino. They approached Bau to manage it. He agreed and the new establishment was effectively built for him. 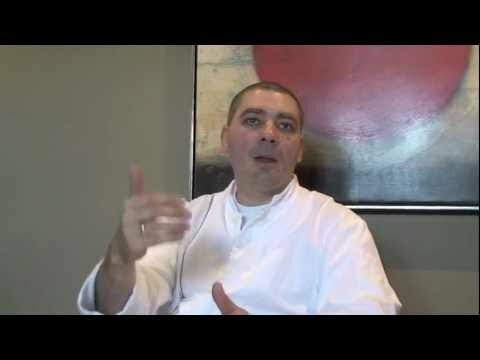 The owner’s gave the new chef complete control over operations and their faith was immediately vindicated by Michelin who awarded him his first star that first year. A second followed the following year. Praise and prizes came from local and international publications before Bau won his star in 2005. The old castle rests adjacent a formal knot garden, itself of some renown. Its immaculate ivory walls and turrets, crowned with ebony mansard roof and sprinkled with golden window sills, give it a striking silhouette against its verdant, rolling environs. 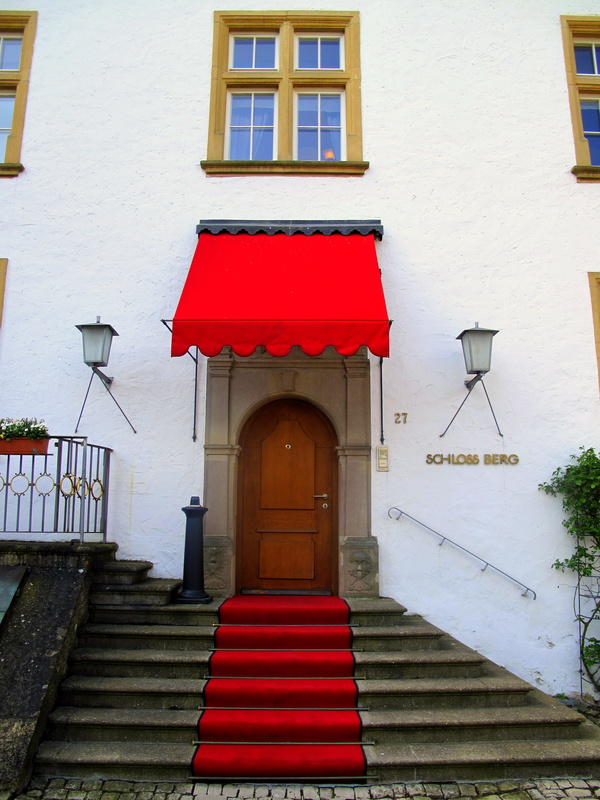 Entering the small, walled, cobbled courtyard that surrounds the schloß, the restaurant is reached after ascending the red carpeted steps before the front door. Guests can take nibbles upon chesterfield furnishings in the atrium inside before moving into the thirty-four seat dining area or private room in the former chapel. The interior was fully refurbished in only January this year. The new, more contemporary décor boasts slate grey walls, wood floor and decorative wooden ceiling. The room is long and narrow with the inside lined with drinks cabinets and the outer with large windows, fringed with pastel olive green curtains, that allow the sunlight to flood in. Spacious tables are well-spaced, their tops covered in white linen over cream. 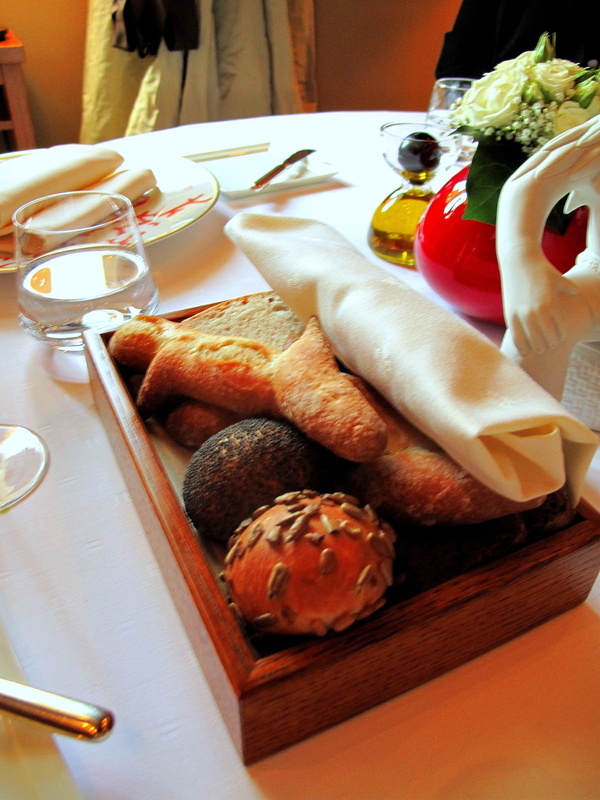 They are set with crockery created by Stephanie Hering of Hering Berlin (credits include Per Se, Ryugin, the Fat Duck, Guy Savoy…) as well as one of her playful porcelain figurines and two lipstick red vases replete with white roses. Custom-made chairs are able to swivel, allowing the diner to get up from the table without moving his seat out. In the far corner, there is a glass-cased fireplace whilst arresting abstract oils in navy, red and white punctuate the walls. Amuse Bouche 1: Kroepoek, Salpicon of oyster and swordfish, green apple foam; tomato, pesto and olive tartlet; yellowfin tuna, avocado cream and olive tapenade; soup of orange, olive oil and basil; roll of avocado/chorizo cream. 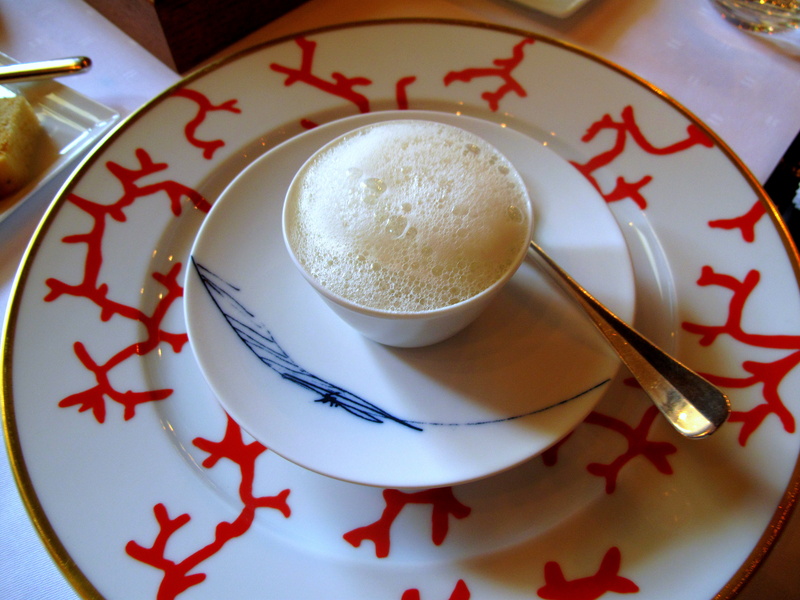 Airy prawn cracker, filled with meaty swordfish and mineral oyster, was topped with sweet-acidic apple mousse. Thick, fluffy tart was layered with semi-dried slivers of tangy tomato and flavoursome pesto. Toothsome kroepoek, smeared with subtle, buttery avocado, was covered with clean, firm ahi and drop of deep, veggy tapenade. Subsequently served, small shot of fruity orange was finished with herby basil and grassy olive oil spume; and brittle, little crisp rolls were crammed with either chorizo or avocado. Amuse Bouche 2: Cornet of smoked eel cream, beef tartare and Imperial Oscietra caviar from Iran. 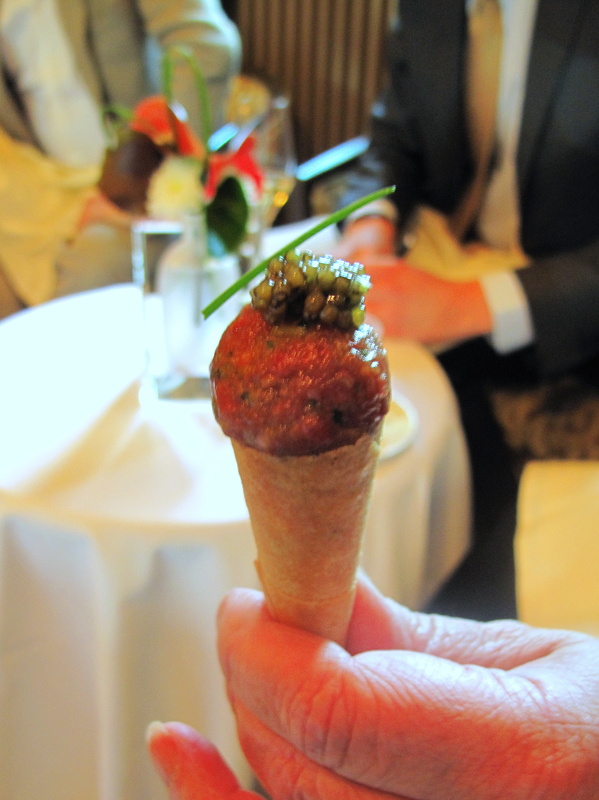 Delicate cornetto, loaded with cream of eel and brimming with a boule of beef tartare, came crowned with Iranian Imperial Oscietra. The nutty, briny caviar cut through the tasty, fresh meat and rich, smoky fish deliciously well. Amuse Bouche 3: Chilled tomato gazpacho with olive oil, buffalo mozzarella, calamarini. 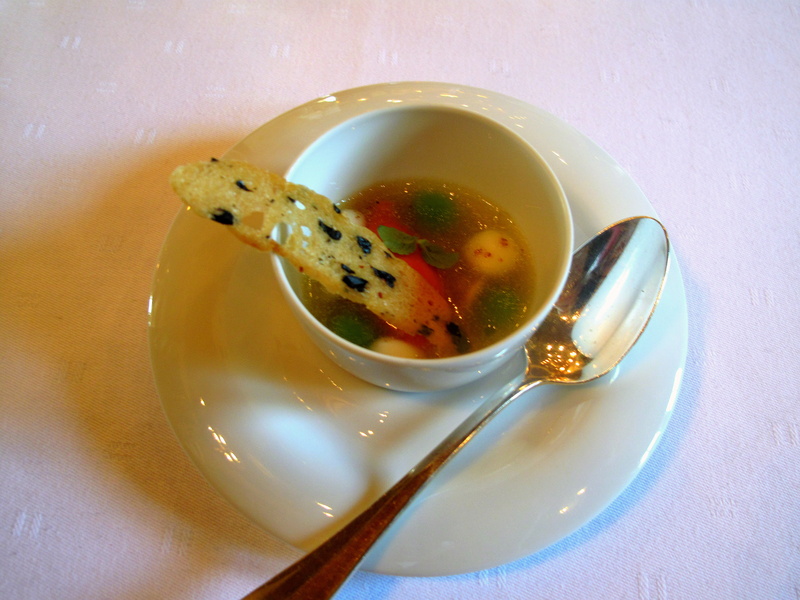 Spherificated buffalo mozzarella and baby basil blades floated in clear tomato consommé and Calabrian olive oil within which sat a scoop of tomato sherbet and calamarini. Zesty tomato, buttery Southern Italian oil, minty-sweet herb and explosively milky bonbons were a classic combination. The baby squid were tender whilst the olive ciabatta tuile, crunchy. Amuse Bouche 4: Goose liver, black truffle and parmesan mousse. Bubbly, alabaster coat concealed an indulgent surprise. Distinctly cheesy-sharp parmesan hid silky smooth, warmed goose liver flan, liberally peppered with black truffle. This was a delightful treat full of intense yet not overpowering savour. 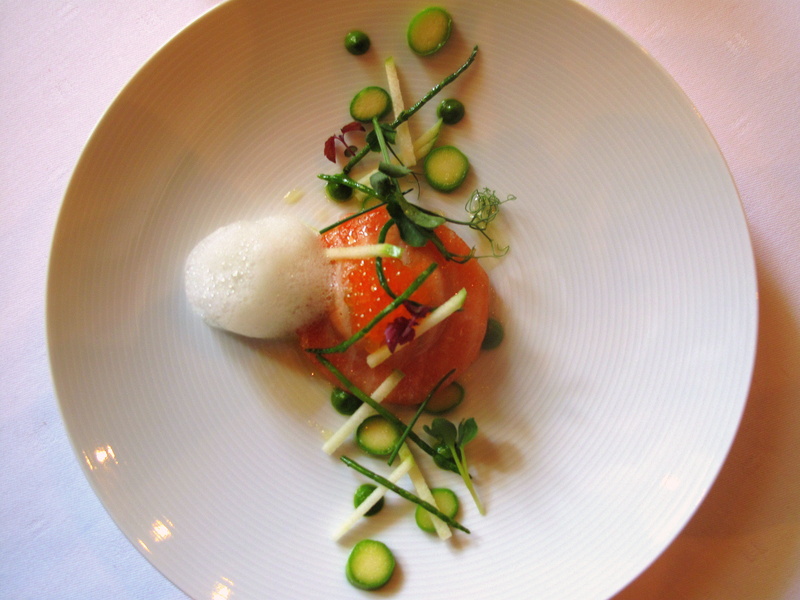 Amuse Bouche 5: Raviolo of smoked salmon with oyster jelly, cucumber and salmon; sea vegetables and char roe. Brunoise of Giraudaud oyster and cucumber, encased in the shellfish’s jelly, came sheathed in a skin of thin smoked salmon with a crest of char roe; pourpier, passe-pierre, green apple julienne, spots of samphire purée and segments of asparagus were precisely scattered in a diagonal across the plate with apple foam resting to one side of the raviolo. The briny-sweet caviar contrasted with the subtly woody salmon whilst the creamy gelée within held elemental oyster and succulent cucumber. The fresh greens added juicy crispness and fruity froth, a little tartness. Die Brote: Focaccia with rosemary and thyme; baguette; dark rye; rye with sunflowerseed; sourdough; sesame roll; pumpkin roll; and poppy seed roll. 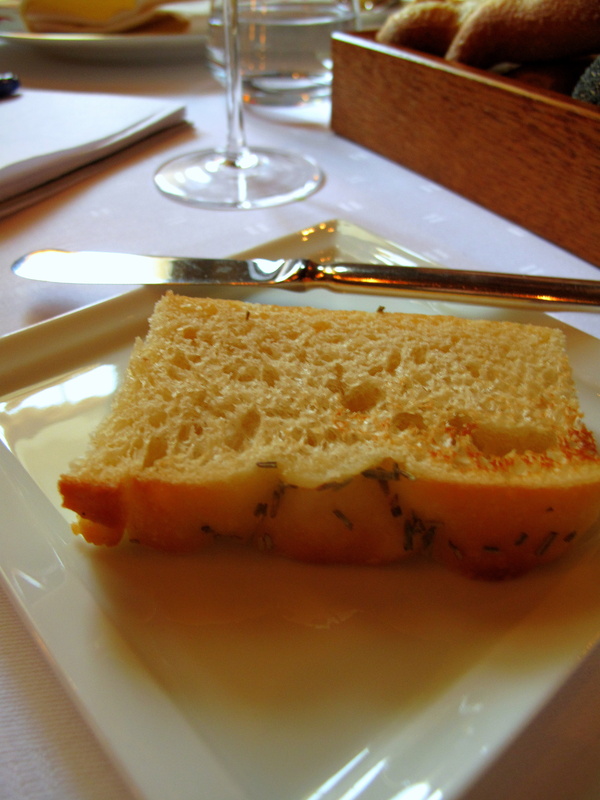 First, following what seems to be German fine-dining custom, a crusty, soft slice of warm focaccia with rosemary and thyme was served. Then, removing the napkin that lay atop a wooden tray in the table’s centre, a treasure chest of assorted breads was unveiled – the recipes for which Bau collaborated with a local baker to create. Baguette was well-seasoned; pumpkin roll, fluffy; and rye, firm with nutty sunflower seeds. Sourdough lacked acidity, but was spongy; poppy roll was aromatic and earthy; and sesame, just decent. More Calabrian olive oil was offered alongside Échiré butter from Deux-Sèvres. Entrée 1: Taschenkrebs & Melone: Mariniert & gebacken / 2 x Wassermelone / Dashigelee. 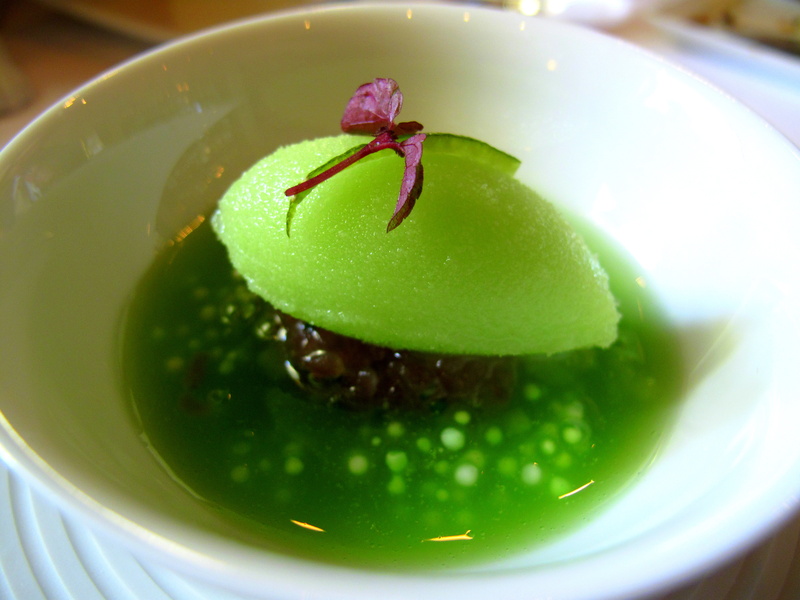 A tian of marinated crab tartare, overlaid with bright yet lucent dashi jelly, scattered with shiso and spiked with triangular seaweed tuile, sat within a vibrant mere of watermelon water and besides the fruit’s sorbet. Arranged about the tower, grilled melon diamonds, individual drops of Japanese mayo, pesto and kalamansi plus a rough ring of its powder, formed a colourful frame. 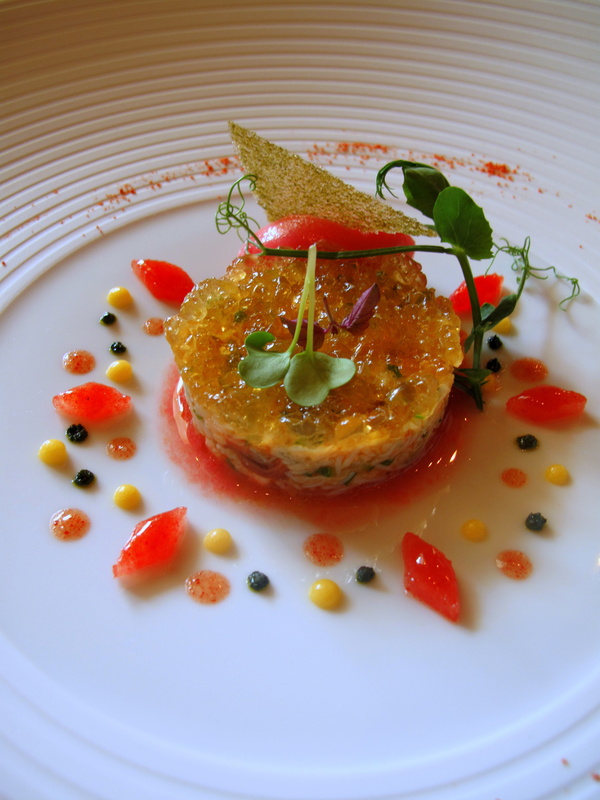 The tender, lacy white meat of the Cromer crab was excellent; its slight sweetness emphasised by the watermelon. The light, but flavourful dashi was an effective counterpoint as was the barely bitter shiso. Mayonnaise, made with mirin (sweet rice wine) and a little sake, had moussy, spicy warmth whilst the kalamansi – a tangerine/kumquat cross much like a lime – had been allowed to age (and turn orange), becoming sweetly sour. 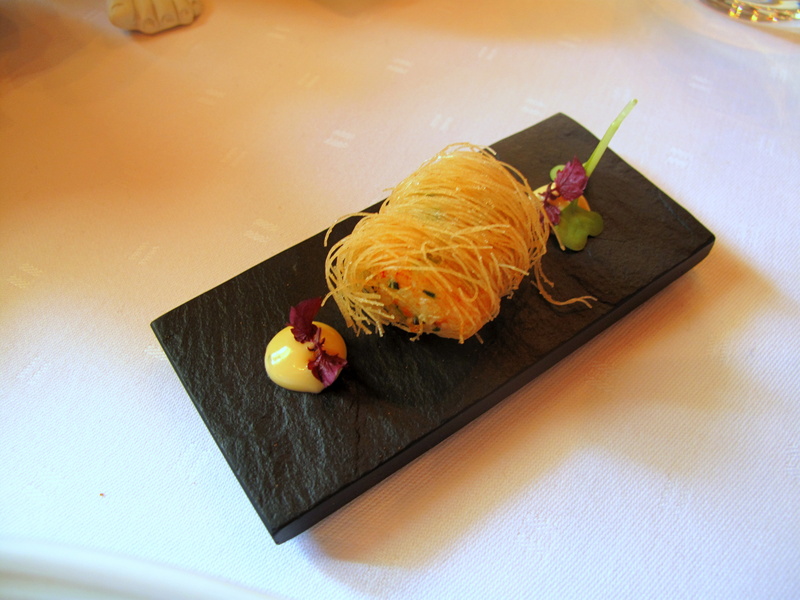 Separately, a second rendition of crab came mixed with shiso, wrapped in kadayif pastry before being deep-fried. Crusty and clean, the little vermicelli-like threads around the bundle had been impressively cooked; the shellfish inside melted in the mouth. More of the mayo supplied pleasant piquancy. Entrée 2: Gänseleber aus dem Elsass; Grüner pfeffer / Gelee & Knusper vom Grünen Tee / Mangofrucht. 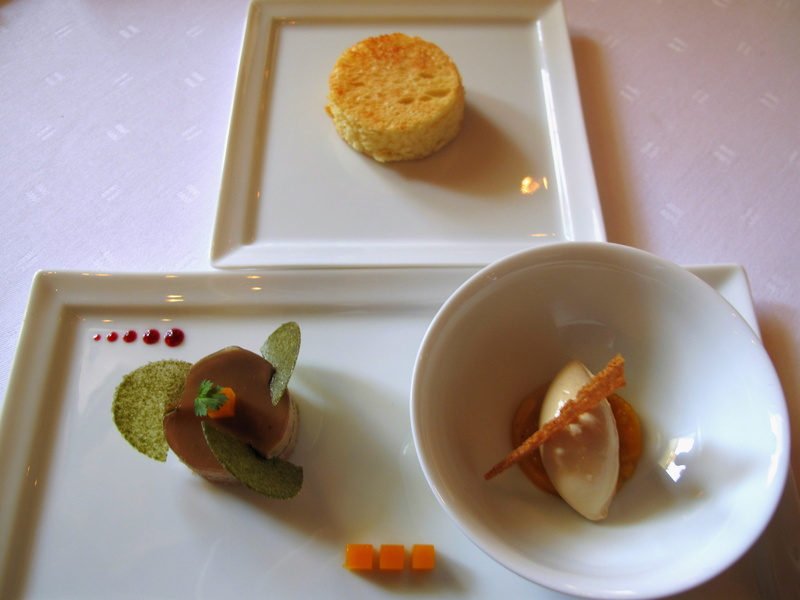 A ‘gateau’ composed of two small circles of goose liver separated by crushed green pepper, overlain with a film of green tea jelly, capped with mini mango cube and set with semi-circles of green tea ‘crunch’, was accompanied by goose liver ice cream covering mango compote; more of the fruit diced and drips of cherry coulis decorated the dish whilst another smaller one carried a toasted disc of buttery brioche. The Alsatian liver was of superior standard. In its initial interpretation, it was smooth, delicate and balanced very nicely the grassy-sweet chips and jelly as well as the gently pungent pepper. The pacojet-produced second portion was cool and velvety with its stronger savour juxtaposed splendidly against the resinous mango. Entrée 3: Blue Fin Tuna: Tataki / Gartengurke / japanisches Gemüse / Ponzu. 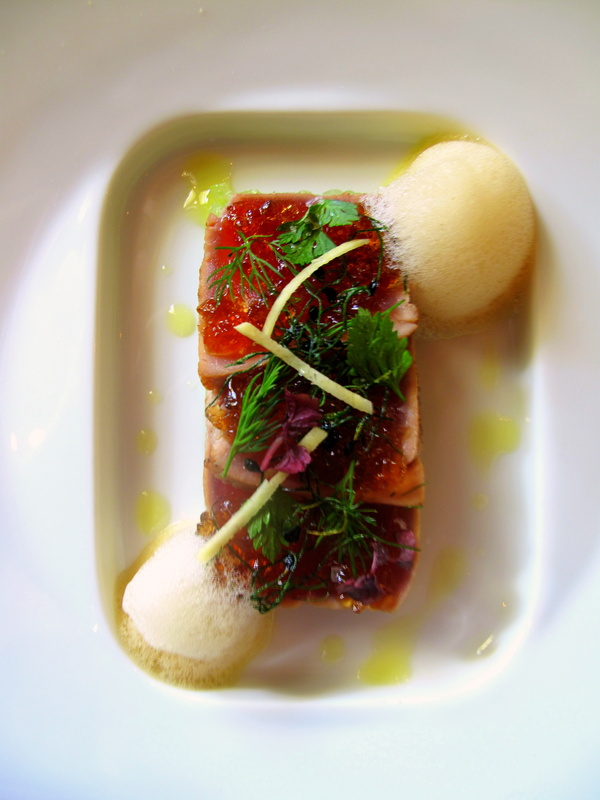 Three overlapping slices of seared blue fin tuna, daubed with dashi jelly and shiso cress, rested atop a compact slab of cured cucumber along with two effervescent pompoms of ponzu. 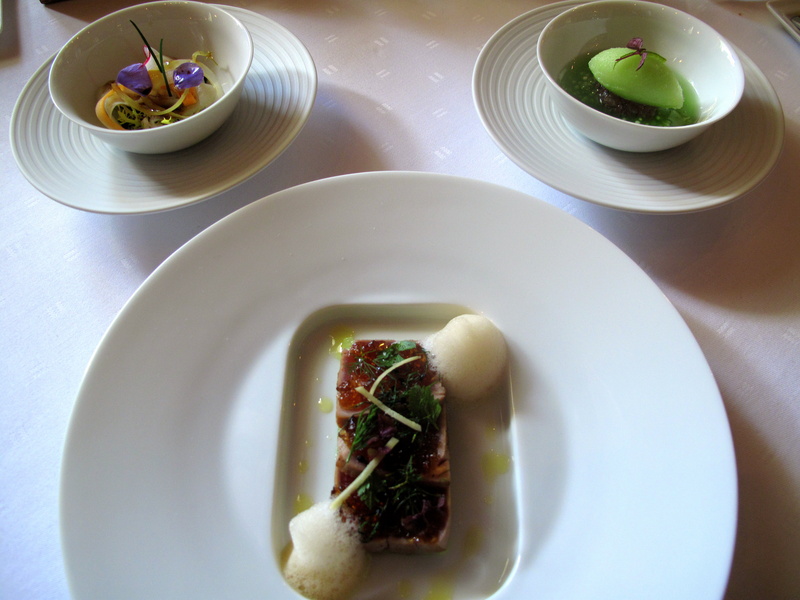 A duo of auxiliary dishes delivered vegetable and abalone salad, lightly mizzled with kimizu; and tuna tataki in chilled cucumber and tapioca soup, topped with green apple-sake-wasabi ice cream. The vibrant trio were instantly appealing. The principal plate proffered first-rate tuna, firm, sinew-less and robust in taste. 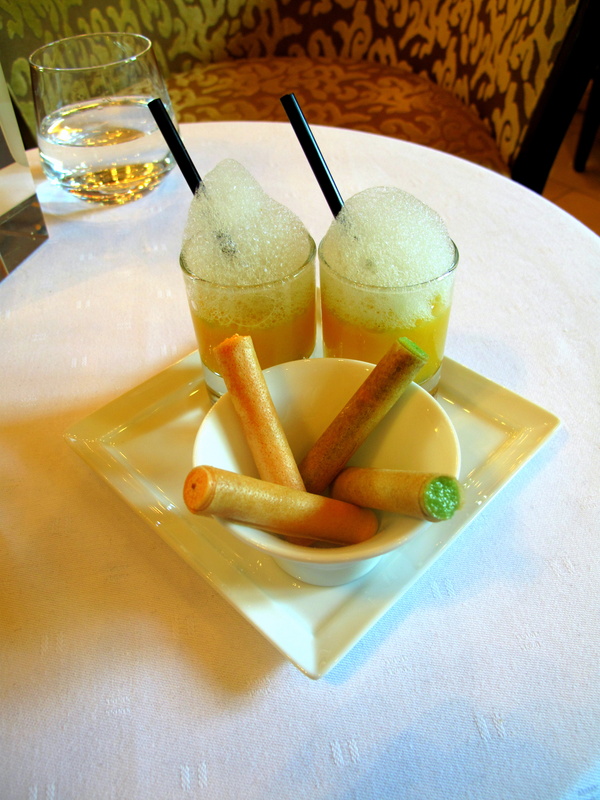 The textural comparison of the cucumber brunoise beneath was very agreeable as was the strength of the soy-citrus froth. The tenderness of the slowly-cooked abalone strips and perkiness of the kimizu – almost a Japanese hollandaise comprising rice wine vinegar, sugar, soy, dashi and karashi (mustard with horseradish) mixed with egg yolks – stood out amidst these crunchy, pickled greens that included carrot, daikon, negi and Japanese potato. The last bowl was quite something to behold – the bright pastel quenelle gracefully poised over darker green, adorned with a single, rich purple, baby shiso leaf. The pearly tapioca and cool, tart ice cream were enjoyable, but unfortunately, overall this was just a somewhat discordant dish. 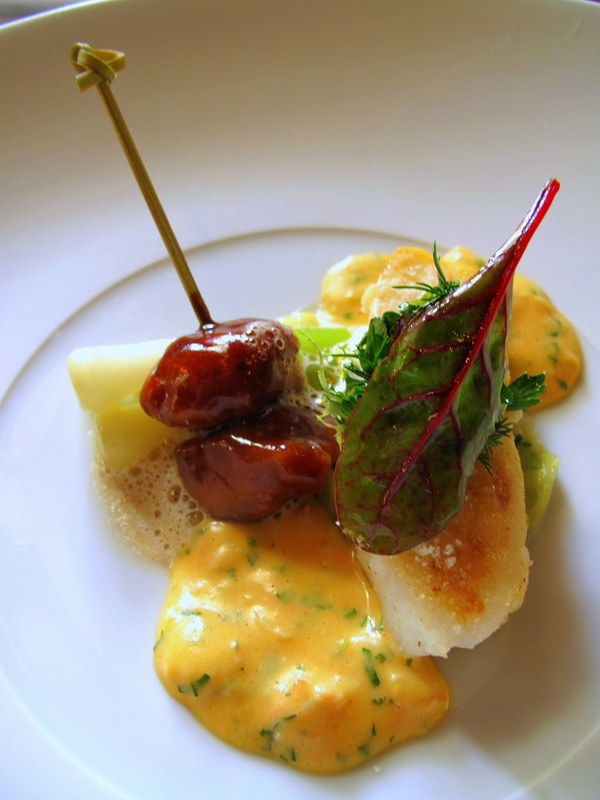 Entrée 4: Coquille Saint-Jacques: Gegrillt / ‘Meereswasser’ Tapioka / Karottenchutney / Schaum & Aroma von Raz el Hanout. 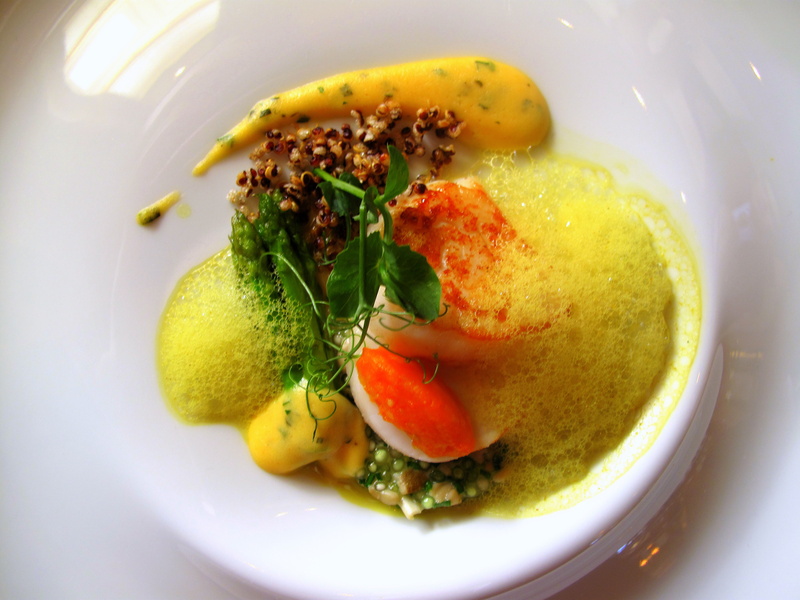 A considerably-sized scallop was brought bisected, its bottom half sitting on ‘seawater’ tapioca and carrying a eye-catching spoonful of carrot chutney whilst the top, showing off its golden-caramelised surface, sat between ras el hanout spume and roasted quinoa; opposite, a tick of herby, rice vinegar hollandaise that also smothered the ends of some small asparagus, added embellishment as did another dabble of the spicy foam and frilly pea tendrils. The grilled shellfish, excellently-timed and evenly cooked, was very tasty. Its mild sweetness, accentuated by the tart carrot, also proved a great foil for the Moroccan mystery blend of hot spices. The briny tapioca of kelp, enoki and oyster water added a little saltiness and interesting consistency as did the nutty seeds. The chervil, coriander, mint and mirin mousseline was sharp and creamy. 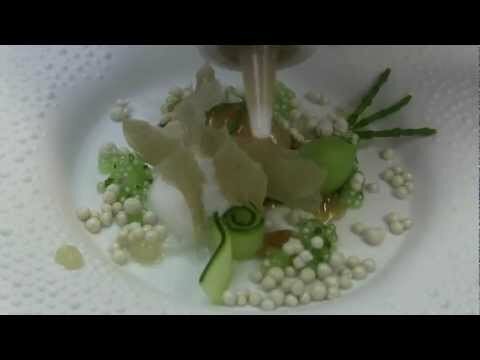 Plat Principal 1: Steinbutt aus der Bretagne: Sot-l’y-laisse mit Hoi Sin glasiert / Kräutersalat / Anchoisaromaten / Krustentierbéarnaise. 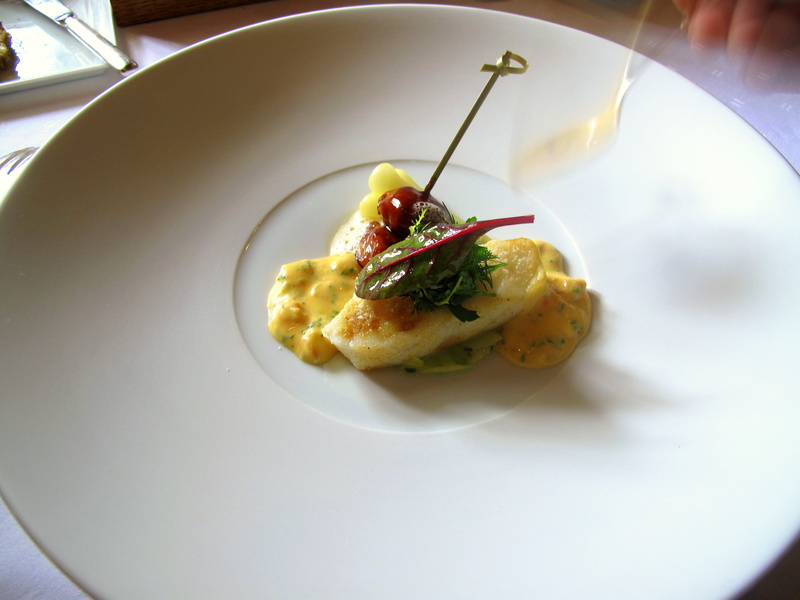 A thick cut of roasted Brittany turbot, superimposed upon sautéed leeks and surmounted by mesclun, was teamed with a skewered pair of hoisin-glazed chicken oysters set in anchovy froth; at the table, a béarnaise of crayfish, langoustine and lobster was ladled either side of the plate. The fish, firm and crisply-coated, was cooked well, however, I must admit I do prefer my turbot to have an unctuous, fatty texture that is rare to find. Let this not detract from the standard of the fish though, which was indeed full of flavour. Crunchy leeks were mellow and sweet; anchovy, sapid and salty; whilst the sauce, ethereal, zingy and sated with the delicious crustacean’s savour. The highlights though were the sot-l’y-laisse. Found buried between the backbone and thigh, under the pope’s nose, these underappreciated morsels – essentially unused muscle – are succulently rich and confit-like. Here, they came with spicy-sweet barbecue-esque coating. 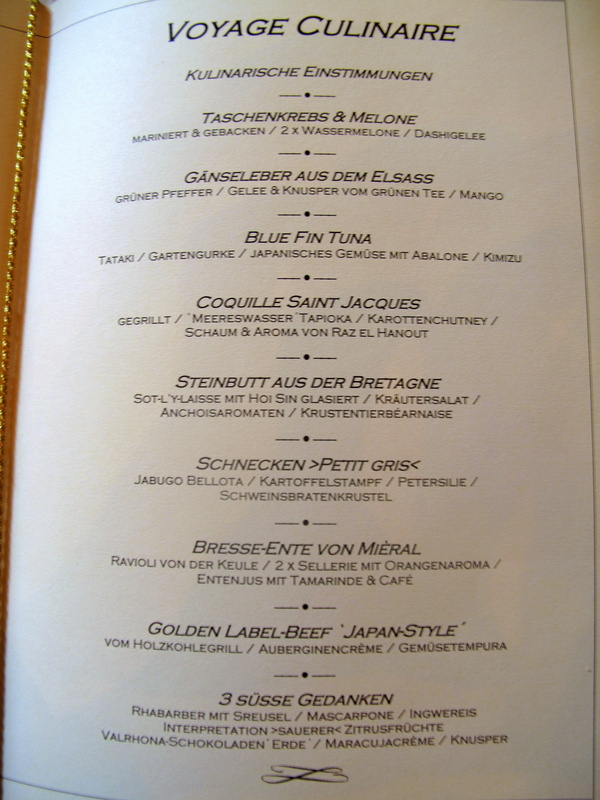 Plat Principal 2: Blauer Hummer / in Butter pochiert / Spitzmorcheln / Dicke Bohnen / Vin Jaune. 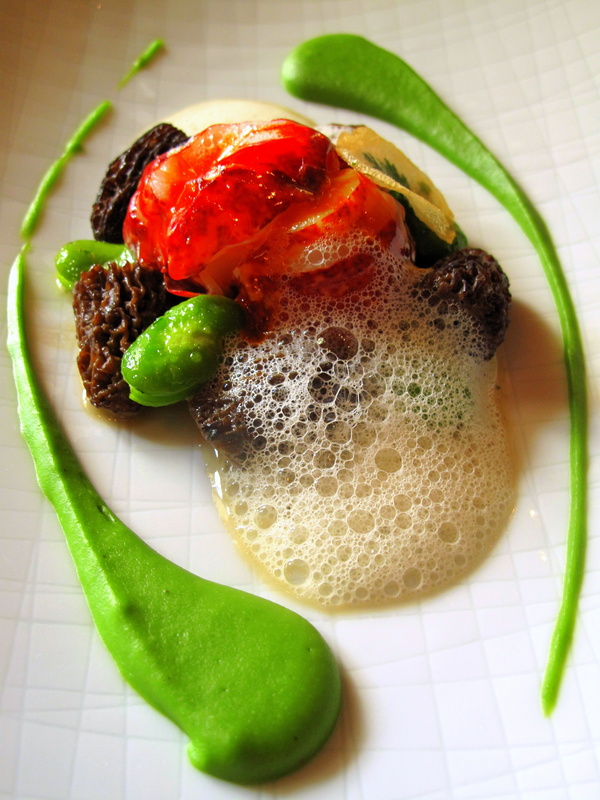 Butter-poached blue lobster overlaid with vin jaune beurre blanc, bordered by broad beans, morels and fried polenta disc imbedded with sprig of chervil, came sitting on a bed of spinach, drizzled in the shellfish’s jus glacé and bounded on both sides by two vibrant whips of pea purée. The lobster, softly cooked, was supple, meaty and delicious. 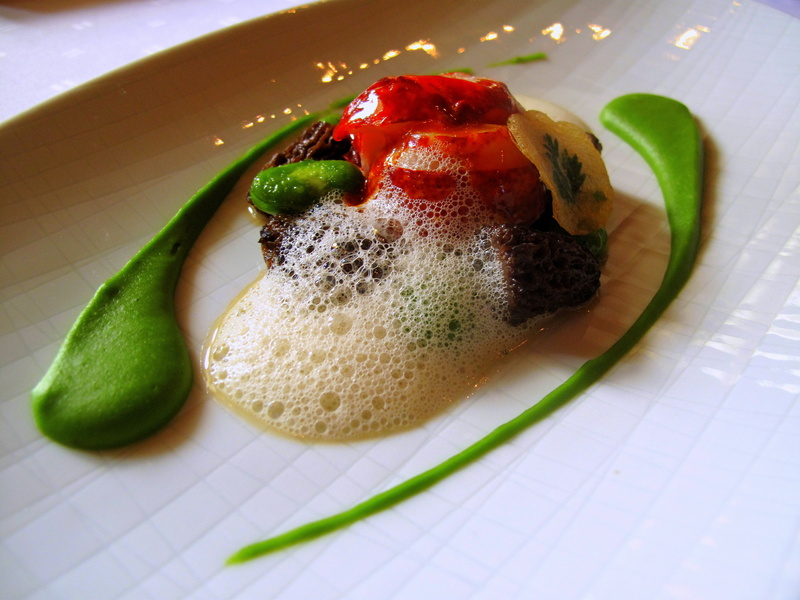 Its sweetness was amplified by the shucked beans, peas, lush jus and wonderfully complex vin jaune. The mushrooms were superb and the best morels I had eaten this season. Polenta offered a touch of aniseed spice whilst the wilted spinach underneath, some substance. Each ingredient here was distinct yet all the flavours literally dissolved into one another. Plat Principal 3: Bresse-Ente von Mièral: Ravioli von der Kuele / 2 x Sellerie mit Orangenaroma / Entenjus mit Tamarinde & Café. 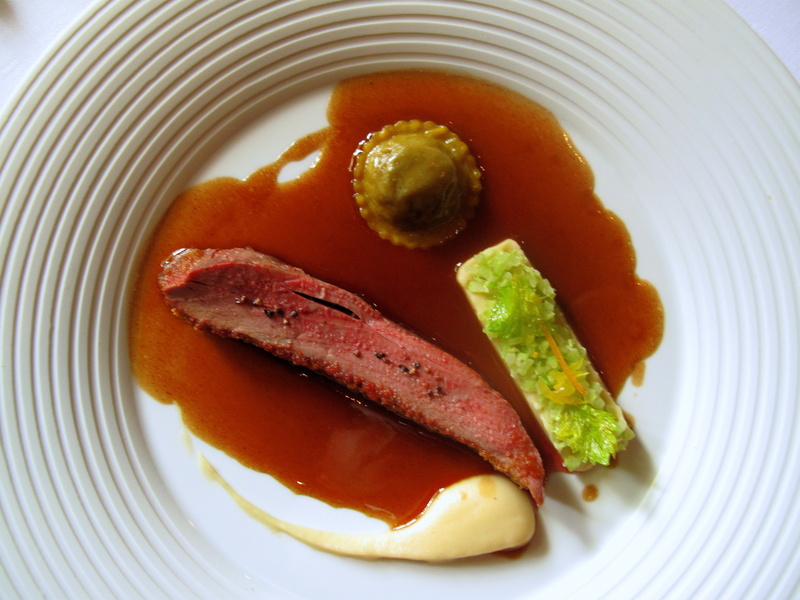 A muscular fillet of Challans duck breast from Bresse, prepared viennoise, was partnered by a raviolo of the bird’s thigh, in addition to a small slab of celery purée covered with its leaf and sprinkled with orange rind; at the table, duck jus enriched with tamarind and coffee was poured. Supplied by Jean-Claude Mieral whose family have been rearing birds in the poultry capital of Eastern France for over one hundred years, the steak-like duck was appetising and tender whilst the well-made, light pasta was filled with savoury shredded meat. Velvety sauce, nearly syrup, was given enticing and intriguing intricacy by the lovely balance of sour-sweet tamarind and bitter, roasted coffee; the thin breadcrumb skin of the bird absorbed this to great effect, turning together into a delectable paste. Celery was a refreshing and cleaning savour against stronger others with the orange, of which only a hint was present, providing a nice, citrus uplift. Plat Principal 4: Golden Label-Beef ‘Japan-Style’: vom Holzkohlegrill / Auberginencrème / Gemüsetempura. Two gorgeous cuts of waygu beef, their brims char-grilled umber whilst middles remained a range of luscious reds between amaranth and crimson, were accompanied by a comet of smoked asparagus with miso and a tableside trickling of jus rôti. 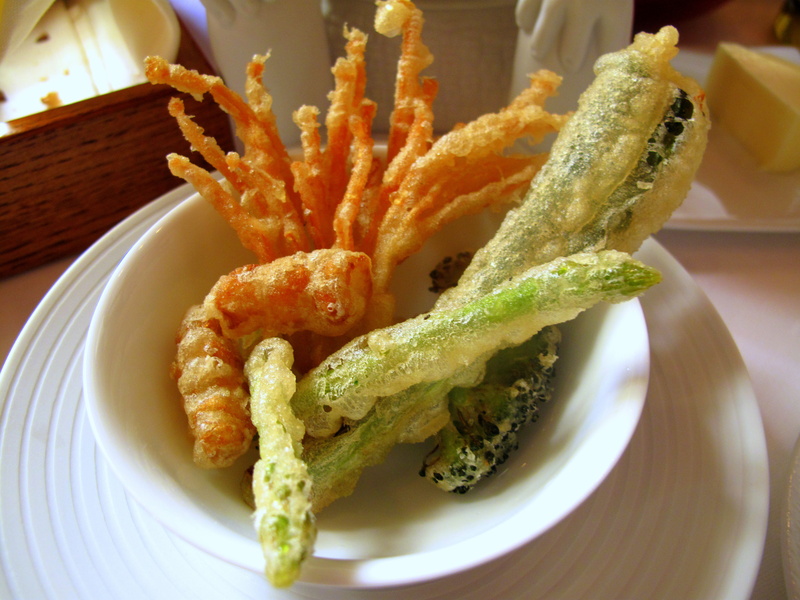 In a bowl besides, Japanese vegetable tempura was served. The American-raised, but pure waygu (not mixed with Angus) A10 beef was delicious. Smoky from the charcoal it was cooked with, the meat melted on the tongue to also release buttery beefiness. The creamy, sweet aubergine augmented the charred taste while miso controlled the richness. 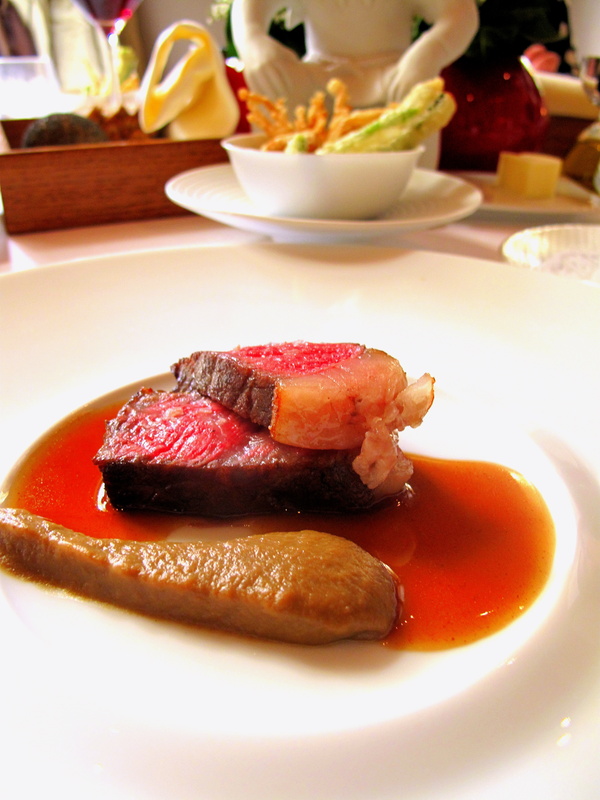 The notably greaseless and still moist greens – asparagus, broccoli, baby leek, crosnes, enoki – were all fried very ably, however for me, they really were rather extraneous: the solitary and simple plate of beef and aubergine by itself was sufficient to suffice as the climatic main course. Pre-dessert: Weiße Schokolade / Zitronengras / Pomelo. 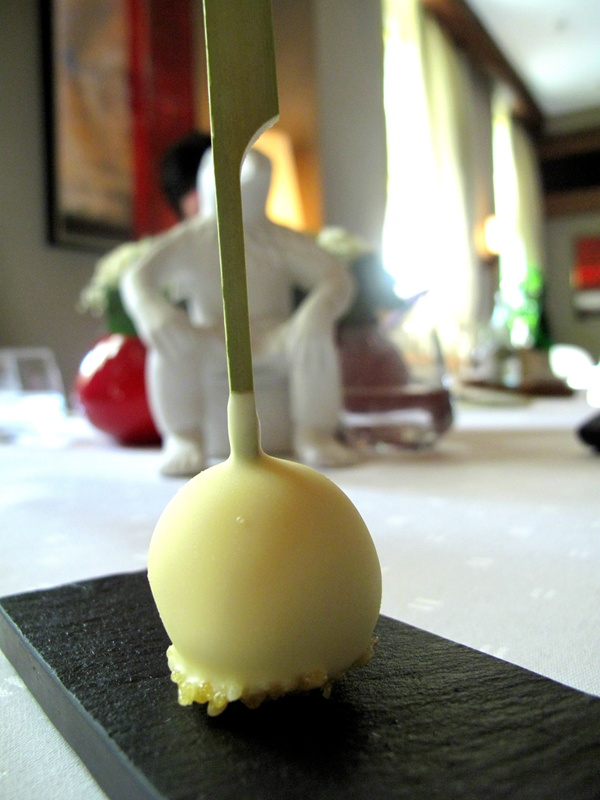 Before the actual afters, a pleasant space dust-studded white chocolate lollipop, containing spicy lemongrass and citrus-sweet pomelo ice cream, was served. Dessert 1: Rhabarber: Kompott mit Streuseln / Mascarpone / Ingwereiscrème. Rhubarb compote tart, strewn over with streusel; blood orange croustillant brimming with mascarpone cream and rounded off with sugared ginger baton; and a rhubarb crisp ladling ginger ice cream comprised the first dessert. The warm tartlet’s grainy, juicy filling was countered by the toothsome crumbs atop. Mild mascarpone cream and foam were nicely teamed with sweet, brittle tuile, but also awfully by a capsule of ginger that emitted harsh, alcoholic syrup that was far too overpowering. The best of the bunch was the toothsome, piquant ice cream and crackly, sharp rhubarb. Dessert 2: Interpretation >Sauerer< Zitrusfrüchte. 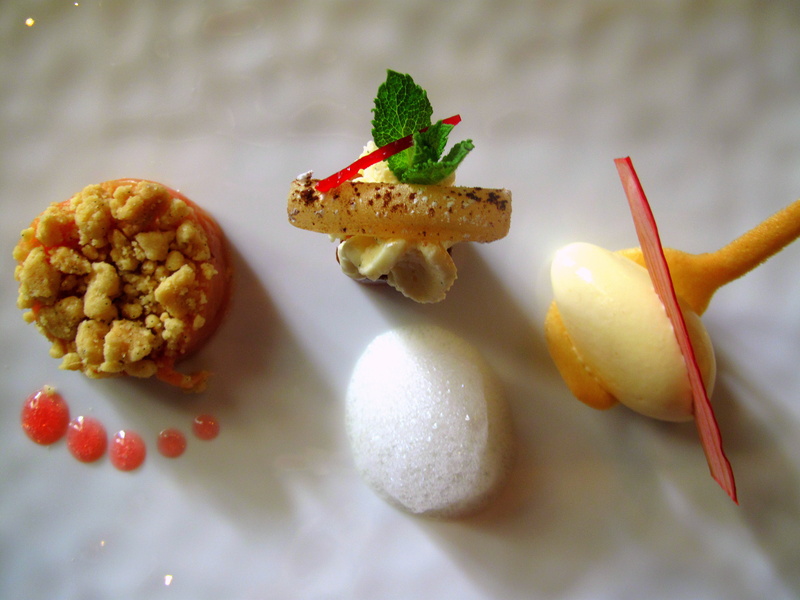 Varied renditions of sour citrus fruits filled three plates: the biggest bearing kalamansi jelly topped with confit shards of pomelo and grapefruit, lemon tartlet and yuzu sorbet atop gelée of its skin; a bowl of Amalfi lemon ice cream over blood orange-vanilla salad; and grapefruit mousse with its fruit mixed with pomelo. Thick, smooth kalamansi was lime-sour whilst its sablé biscuit base, crunchy; syrupy-tart lemon had decent baked crust; and yuzu was pleasingly acidic. The ice cream of sfusato Amalfitan – queen of lemons – was deeply flavoured whilst the marinated orange, fleshy and juicy. Airy grapefruit mousse came with sugary mint and plump citric segments. Dessert 3: Valrhona Schokoladen ‘Erde’ / Maracujacrème / Knusper. A mound of crushed dark chocolate and coffee, littered with little bricks of passion fruit jelly, was encased in a large glass sphere. 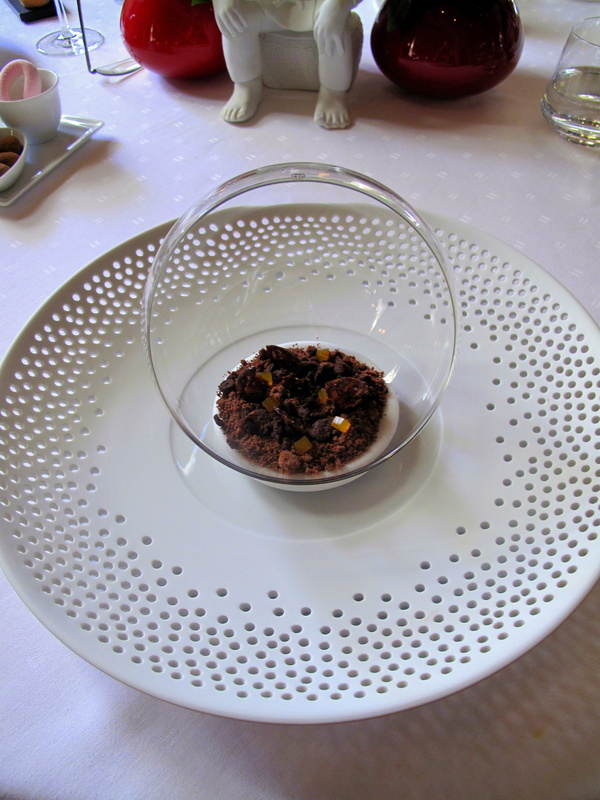 It was the most modern presentation of a dish yet and resembled some sort of intergalactic-take on a biosphere. The earth of Valrhona Guanaja was quite bitter and lingered on the palate. 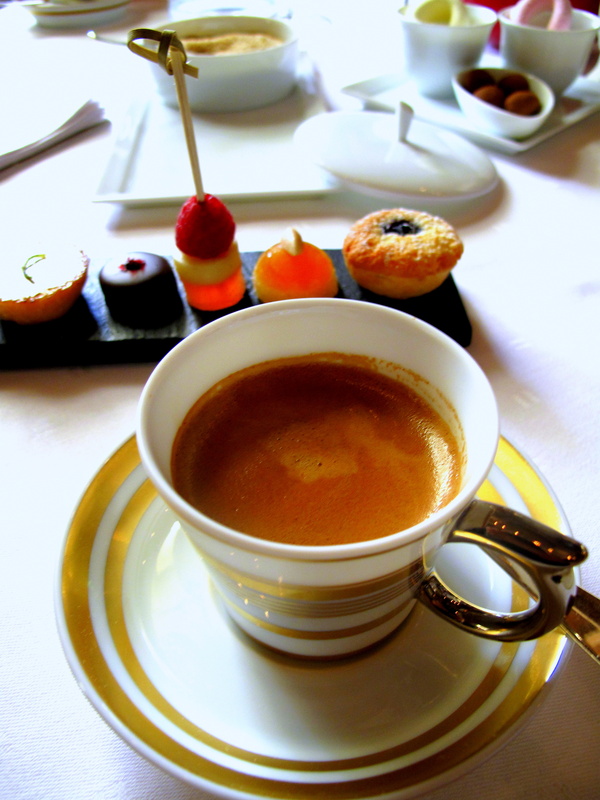 Maracuja had kick and played on the faint fruity note in the chocolate whilst coffee added smokiness. 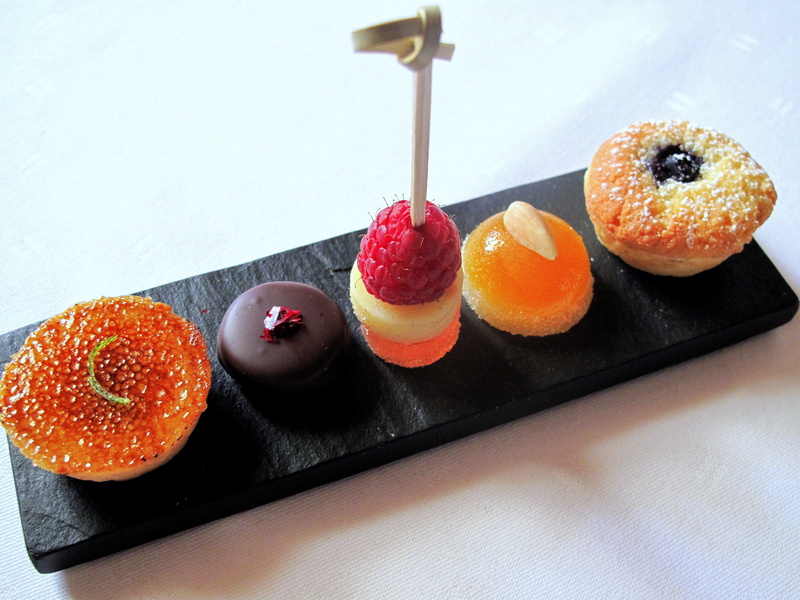 Petit Fours: Rose and orange marshmallow; milk chocolate almonds; lemon tartlet; cherry marzipan; Peach Melba; almond and apricot jelly; blueberry cake. A platter was presented with very light and spongy, but slightly dry blueberry cake; flavoursome almond-apricot gelée; moist deconstructed Peach Melba brochette; nutty, fruity marzipan chocolate; and tangy, crusty lemon wedge. Another salver served had chocolate-covered almonds with their skins interesting left on as well as one cup of rose and another of orange marshmallow tubes that were both very good. Service was professional yet very personable. Led by Yıldız Bau, the staff – all females – were attentive, friendly and admirably knowledgeable. Sommelier Britta Jäger proved extremely patient and genial whilst Frau Bau herself was very enthusiastic, considerate and gracious. The atmosphere in the room was terrific. The serveuses and the surroundings all came together to create a very certain sense of festivity and event, which is precisely what I believe and expect dining at this level ought to feel like. 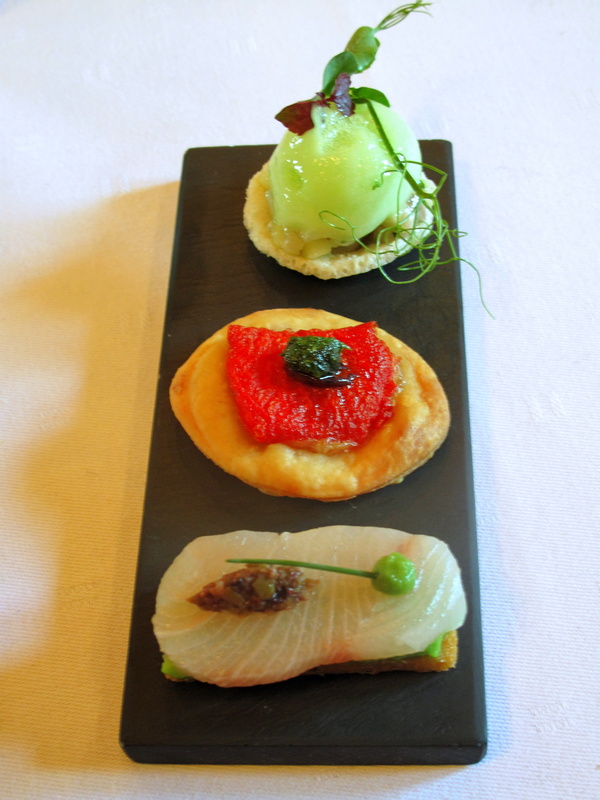 At the start of the meal, we were bestowed with a nice array of canapés in the restaurant’s anteroom before a couple more (substantial) amuses once seated at the table, both of which (the goose liver and raviolo of smoked salmon) were technically and tastefully adept. 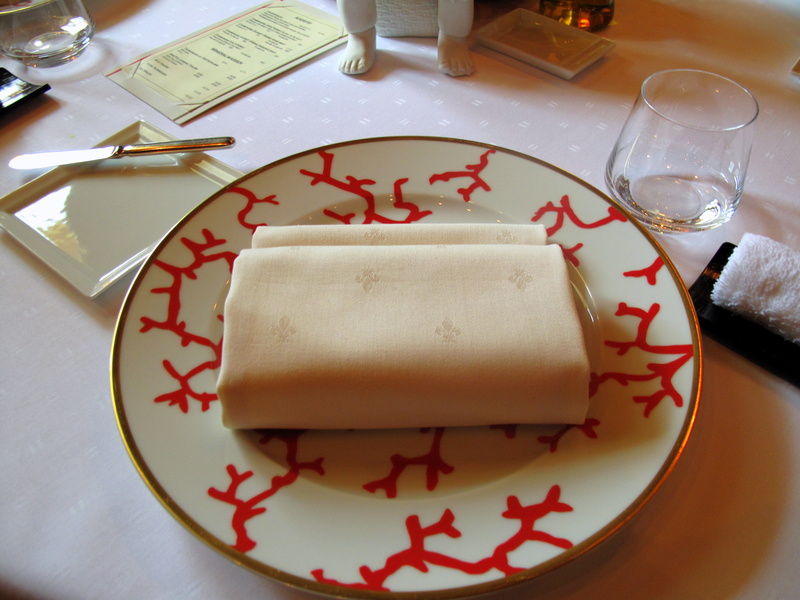 Lunch proper began with taschenkrebs & melone – Bau likes to include a crab course in his menus and this delightful and attractive dish showed why. 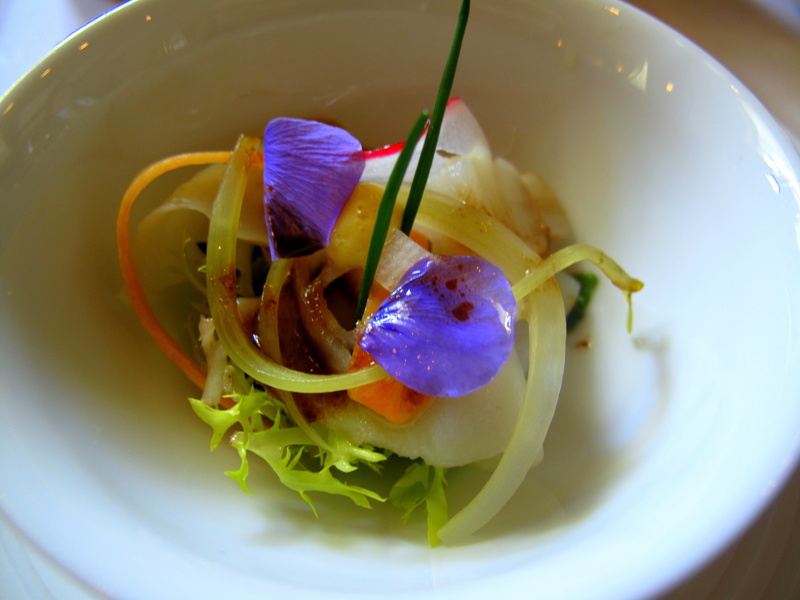 The ensuing two plates were both good, but it was the coquille Saint-Jacques that next stood out. This was a cleverly thought-out recipe executed very well. Steinbutt aus der Bretagne was hard to fault and, even though my contrary preferences regarding this fish, I still enjoyed the inclusion of the seldom-seen sot-l’y-laisse very much. Blauer hummer was simply delicious: (some of my favourite and) quality ingredients cooked consummately and balanced brilliantly. 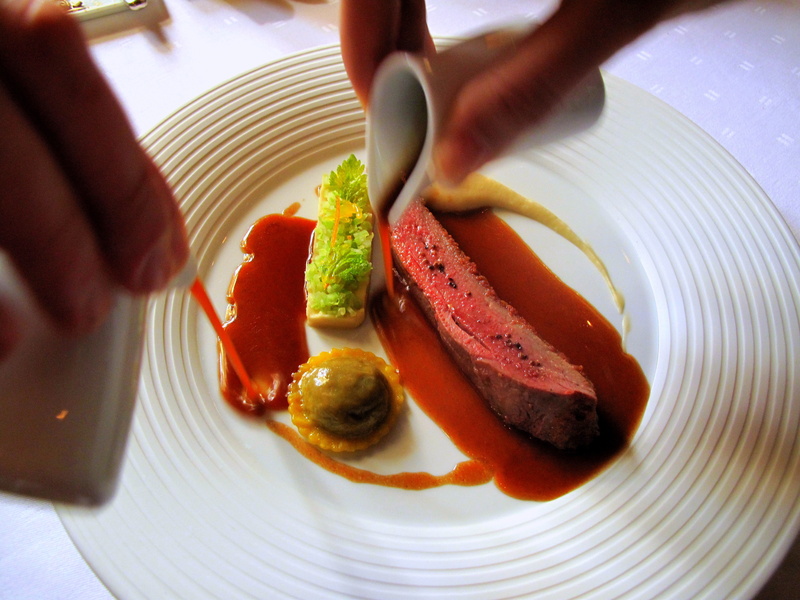 Subsequent servings of Bresse-ente von Mièral and golden label-beef ‘Japan-style’, each very appealing and showing much skill, maintained the momentum. 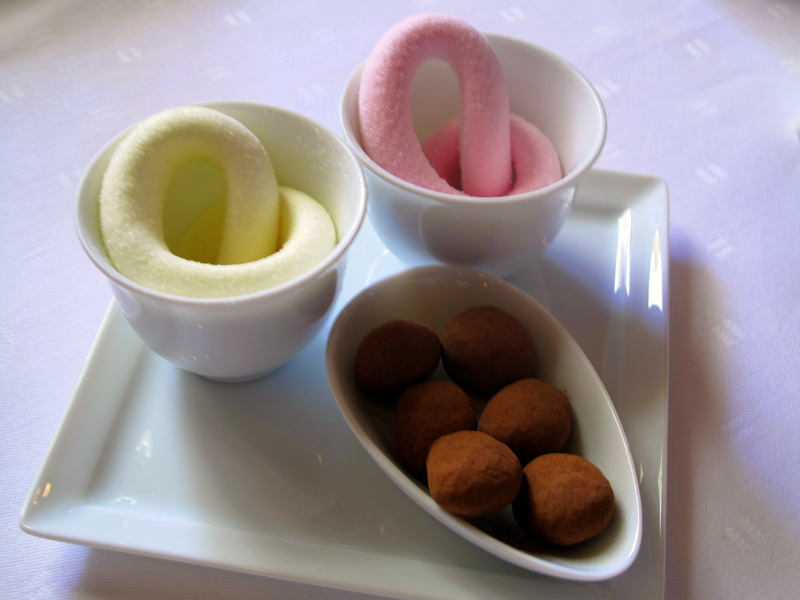 When it came to sweets however, I thought the savouries simply better, but of the three desserts, it was the interpretation >sauerer< zitrusfrüchte that I liked most. 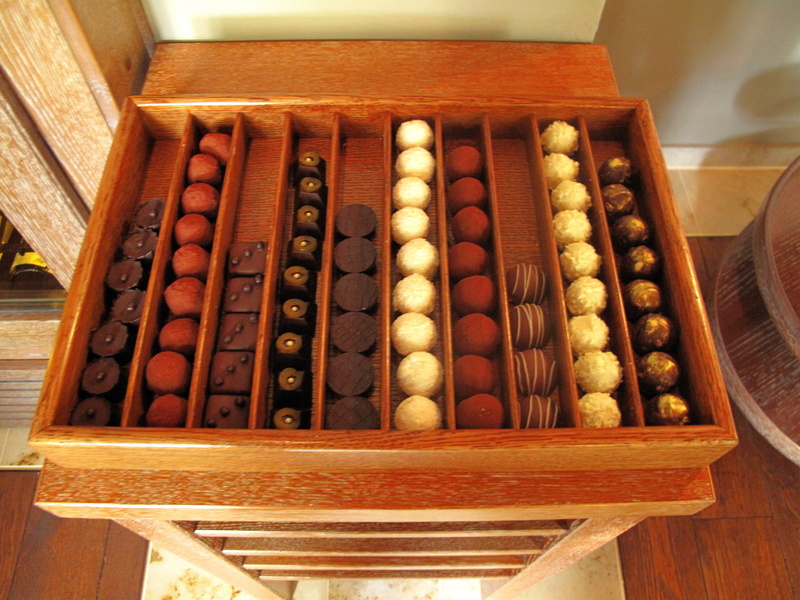 Petit fours and mignardises were also of high standard. The timing of this visit was not without import. As it so happened, it was around this time that my true tastes vividly revealed themselves, clearer and more concentrated than before. Although gastronomically curious and open-minded, I must confess that my own predilections lie less towards the classics and closer to the styles currently realised best by the New Naturals. Bau is clearly rooted in the former category yet despite that – but maybe more impressive because of it – I still thought this an excellent meal and left inspirited. What appealed to me most today was the intimate character of the cooking. Meeting Christian Bau ahead of and after the meal – ‘for my taste, good gastronomy begins with a warm welcome… [and] ends with seeing my guests off personally’ – he immediately stuck me as the modest, hard-working yet kind-hearted, keen perfectionist. 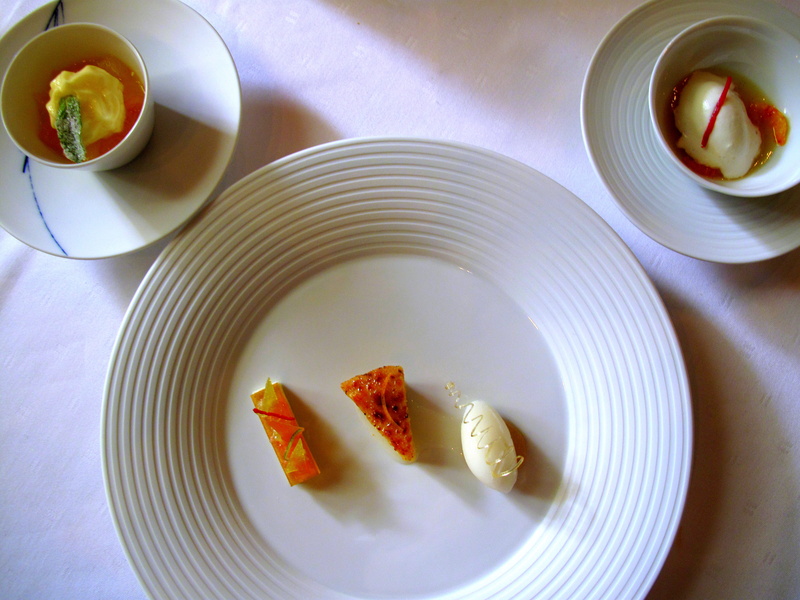 This came through in the cuisine: intricately constructed courses that were technically faultless whilst vibrant, sometimes unexpected and even joyful. You sensed that the chef was enjoying himself in the kitchen and was proud and eager to share his cooking with you. 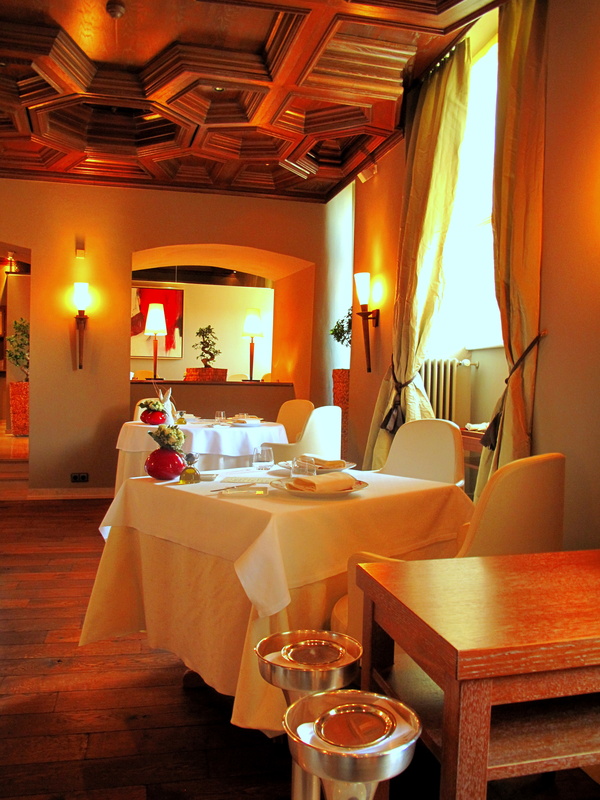 As mentioned, Bau’s base is traditional French haute cuisine – something he picked up and practised to great effect under Wohlfahrt at Schwarzwaldstube. He learned about precision and discipline preparing this German legend’s pure and clean classical dishes that betrayed but a whiff of the modern – and such lessons are still evident today. Bau labels his own approach as a light and contemporary interpretation of French cuisine, stating that he wants to renew tradition and that he is from a new generation of chefs cooking for a new generation of customers. With this in mind, and working with complete freedom, his technique has evolved whilst at Victor’s into a simpler, leaner expression that increasingly incorporates more Asian influences. Beginning with exceptional ingredients – ‘I firmly believe that the best is just good enough’ – dishes are built around a more familiar, refined product supported by a cast of interesting and creative elements. 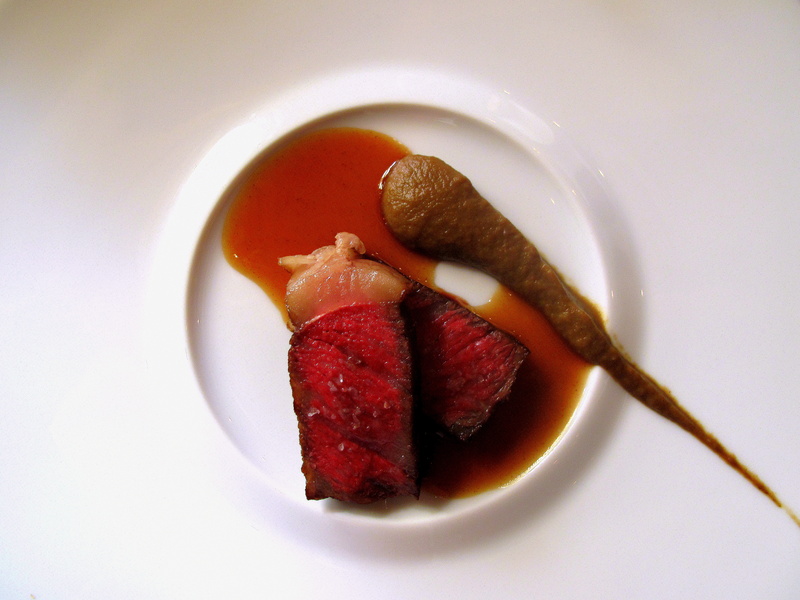 Beurre blancs, hollandaises and béarnaises still abound as reminders of Bau’s roots, but chutneys, hoisin, ponzu and kimizu sauces inform one of his growing partiality. Indeed, embracing different cultures is fundamental to neue deutsche küche and this chef has certainly taken Japanese cookery to heart. He spoke very fondly of his latest visit there at the start of this year and was obviously excited by what he had found. Thus it was not unexpected then to see Oriental touches feature almost throughout our meal – what maybe was surprising was the seamlessness and seemingly effortless way in which these were integrated into dishes. The chef’s uncompromising standards and his genuine affection for the Far East were no doubt responsible for this. Another appreciated aspect of this lunch was its lightness. Courses were considerable in portion and number, but remained delicate and easy-to-digest. Even given the multiple-plate methods and complex arrangements of this labour-intensive style that abhors shortcuts, there was a deceptive unfussiness in presentation and flavour combinations. Additionally, whilst sauces had relish, they were not decadently applied. On a more minor note, a further apparent trait of the chef was his keenness for combining the humble with the luxury; the eel-beef-caviar cornet possibly being the best example of this. Having eaten at Vendôme only the day before, it is difficult not to compare Bau and Wissler – two chefs oft spoken of in the same breath as leaders of neue deutsche küche and each similarly assiduous, able and ambitious individuals. For me, the difference between the two restaurants was patently clear and may be summarised in a single sentence: at Vendôme it seemed like an army of cooks had prepared the food; at Victor’s, it felt as if a single artisan was at work in the kitchen. Bau believes ‘high-end gastronomy has a lot to do with personality’ – and I wholeheartedly agree. He allows and wants his to shine through and it does. The cooking is serious, but it is bright, caringly created and intermingled with subtle, individual nuances. Similar things can be said about the setting, which was elegant, but warmed with whimsy. There was a quaint charm here with an honest generosity that infused the entire experience. The already detailed air of celebration and occasion, expressed and emphasised most by Herr and Frau Bau themselves, really made the meal memorable. Furthermore, greeted, treated and then finally seen off by these two doting hosts, one is reminded of a small family restaurant. This in itself is equally winsome and endearing.